No parent wants to hear the words, “Your child is sick,” from the pediatrician. Unfortunately, every two minutes, a child is diagnosed with pediatric cancer and life for that child and their family dramatically changes. That’s why every September, we aim to raise awareness on behalf of the kids, families and communities affected by life-altering conditions like retinoblastoma. Today, thanks to the hard work of doctors, volunteers and those dedicated to finding a cure, 4 out of every 5 children diagnosed with cancer will survive 5 or more years. Their commitment and perseverance has almost halved mortality rates of certain cancers, and we are closer every day to finding a cure to the #1 disease-related killer of children in the US. Even if you or a loved one are not directly involved with cancer, there is still a lot you can do this month to help. The good news is that plenty of foundations make raising awareness a simple and enjoyable thing, no matter your age or schedule. We’ve put together a list of some charities dedicated to helping affected children, teens, and their families, so you can get involved. Saint Baldrick’s Foundation is a volunteer organization wholly dedicated to finding a cure for children’s cancer. They have raised over 200 million dollars for cancer research in 27 countries world-wide. Through their website, you can get involved in your community, find videos to share on social media, leave a donation, or even learn how to start your own fundraiser this September. The American Childhood Cancer Organization (ACCO) is another group leading the way in support for patients and families. You can visit their online shop where you can purchase items to help raise money and awareness, or purchase specially-designed resources geared towards helping those battling cancer themselves. The best thing about the ACCO is that, via their website, you can get involved directly with groups in your local area that fundraise and provide support. The Children’s Cancer Research Fund is a revolutionary group that has been advancing how pediatric cancer is treated since 1981. Whether it’s your child, a child you know, or even if you want to just get involved, their website is a great resource for practical information on how to help. With amazing organizations and volunteers working tirelessly, hopefully one day we’ll be able to eradicate childhood cancer for good. 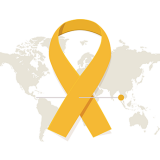 So this month, tie on a gold ribbon and help raise awareness for children across the globe. Together we can help find a cure.